No, it's not an ESPN gymnastics special—it's yet another weekly roundup of new products for iPad protection, and it just so happens to include several mounting solutions and a new product from Handstands. Our Inboxes are overflowing with info—the release of the iPad 2 has case manufacturers scrambling to introduce new accessories for both the original magical device and its newer cousin—so, without further ado, let’s dive right in. Bella Cases: If leather is your material of choice, Bella has an excellent selection of elegant and functional cases available for the iPad, starting with the Snella (iPad; $60), a sleeve that comes in black, tan, white, or crocodile black. The Verde (iPad; $76) is an envelope-shaped sleeve that features a soft interior for comfortable protection; it comes in black or white. For a more traditional look, Bella also makes the Libretto (iPad; $90), a folio-style case that doubles as a landscape-orientation viewing stand and typing platform. The Libretto is available in black leather with either a traditional or crocodile-skin texture. Finally, the Leggera Functional (iPad; $100) takes the folio concept even further, providing multiple viewing angles. It’s available in black, orange, or red. Ekocase: The latest KickStarter-backed iPad product, the Ekocase 2 (iPad & iPad 2; $35 and up) features a clever, all-wood construction that uses bamboo pegs to keep the iPad in place and doubles as a headrest stand. If the project receives enough pledges and the case goes into production, the manufacturer plans to offer the Ekocase 2 in black, blue, orange, or red-orange. Handstand: The iPad 2 version of the Handstand is a convenient accessory that lets you hold the tablet safely and securely in one hand while you use it with the other—you can even rotate your iPad without letting go of it. This case is obviously designed for situations where a free hand is useful, such as presentations and medical visits. The iPad 2 version will ship in early May and is currently available at the discounted price of $40. Laptop Tailors: Don’t let the white sleeve on the company's Website fool you—Laptop Tailor’s Felt Sleeve (iPad & iPad 2; €30 and up), which provides soft, snuggly protection for your device, is available in nine different colors. You can even order a slightly larger model that fits an iPad 2 with Smart Case, or opt for an additional external pouch that fits your iPhone. 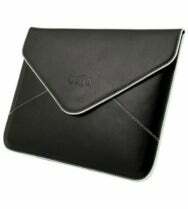 Sena: Fine-leather accessory vendor Sena has announced a slew of new iPad cases. 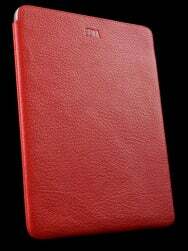 Florence (iPad 2; $70) is a thin, book-style case bound in leather and available in black, orange, red, or brown. The Folio (iPad 2; $90) has a bit more bulk than the Florence, but can also be used as a viewing stand in three different positions; it is also available in black, orange, red, or brown. The Ultraslim (iPad 2; $60) is a pouch that, despite its light weight, features a soft velvet interior and comes in black, red, brown, white, green, or pewter. There's even a version that fits an iPad 2 with a Smart Cover attached. The Collega ($150) is a handy bag that fits the iPad 2, with or without a SmartCover, and comes with plenty of pockets and extra space for your papers and accessories. It’s available in black, red, crocodile black, or crocodile red. The elegant and simpler Executive Sleeve (iPad 2; $100) can also be had in those same colors. Finally, the Sacola—appropriately enough, Portuguese for “bag”—features a tote-bag design and dual-textured leather construction. 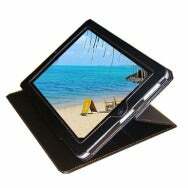 It comes in crocodile black, and its soft, micro-velvet interior keeps your iPad 2 safe with or without a Smart Cover. Trendy Digital: Nothing ruins your day like a mobile device that takes an unexpected dive at the beach or in the family’s swimming pool—unless, that is, you happen to have one of Trendy’s WaterGuard Plus (iPad & iPad 2 $28) cases, which provide waterproof protection for the iPad without interfering with your ability to use its touchscreen or—with the iPad 2—take pictures. In the folio category, Trendy’s Dimension Case M (iPad 2; $45) is a folio-style case that features a clever magnetic-attachment mechanism. 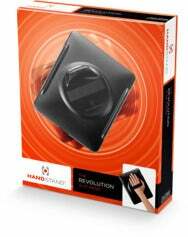 Available in black, it supports several orientations and viewing angles. Finally, if you happen to be on the lookout for a more traditional setup, the PadGear Plus (iPad 2; $45) has enough room for a keyboard and secures your iPad with a t-structure to keep it firmly in place without blocking access to its ports. Vogel: The RingO (price varies based on accessories) is a clever mounting system for the iPad 2. It features a snap-on hardshell case with a round receptacle that acts as a universal mount for a number of accessories, including stands, car and wall mounts, and more. If you frequently find yourself switching between multiple cases because you need to use your iPad in different configurations, the RingO might be just the thing you need. Woodford: The FridgePad (iPad & iPad2; £35), as its name implies, is designed to keep your iPad and your fridge happily connected. The mount features extra-strong magnets that will not scratch or damage either end of the bargain and is available in red, black, white, silver, or cream. XGear: The SmartCover Enhancer (iPad 2; price unavailable) is designed to provide protection for the back of your iPad 2 without interfering with Apple’s own screen cover. The Enhancer comes in black or clear and will be available for sale on April 18.